SovMusic.ru - " Internationale "
Last updated on 19.07.2009, total number of songs: 547, shown are songs from 1 to 50. A spanish song from the times of the Spanish Civil war 1936-1939гг, sounds like "Warszawjanka"
Lyrics: Valeriano Orobun Fernbndez 1936. "Our goal - USSR worldwide ! " Music: G.Eysler Lyrics: I.Frenkel 1929. Music: A.Aleksandrov Lyrics: Mikhalkov i El-Registan 1944. Singer: Pol Robson Performed in 1949г. Music: A. Aleksandrov Lyrics: S. Mikhalkov 1977. Song of Greek partisans of WW2, uses music of famous soviet "Partisans of Amur"
A French song on the music of famous sovoet song "Song about wind against us"
Can be translated as "Forward, comrade"
Music: Luís Cília Lyrics: Luís Cília 1967. "Fight for communism and don't leave that way..."
Music: Carlo Tuzzi (obrabotka) Lyrics: Carlo Tuzzi (ital. ), Peter Hacks (nem. ), Tatyana Vladimirskaya (rus.) 1908. Singer: ansambl Grenada Performed in 1987г. Music: Carlo Tuzzi (obrabotka) Lyrics: Carlo Tuzzi 1908. "Boris za kommunizm i ne soydi s puti!" Music: Carlo Tuzzi Lyrics: Carlo Tuzzi 1908. Music: L.Radin Lyrics: Hermann Scherchen 1918. 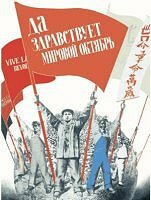 "We'll raise Red workers' baner over entire Earth..."
"We'll raise the Red Banner of labour over the Earth!" Tr:"Brothers, to the sun, to the freedom"
Music: Dmitriy i Daniil Pokrass Lyrics: Erich Weinert 1936. Singer: Oktoberklub Performed in 1968г. Music: Ne Er Lyrics: Tyan Khan 1935. Singer: Pol Robson Performed in 1949г. Music: Georgiy Nosov Lyrics: Aleksandr Churkin 1950. Music: Gans Eysler Lyrics: Bertolt Brekht 1936. Singer: Hermann Haehnel Performed in 1970г. Music: A.Aleksandrov 1941. Singer: Ernst Bush (Ernst Busch) Performed in 1967г. Der heilige Krieg - Svyashennaya voyna NA NEMETsKOM! German march on the music of "White Army, black baron"
Music: P. Degeyter Lyrics: E. Pote 1871. Singer: Schalmeienkapelle d. Rotfrontkaempferbundes Berlin-Koepenick, 16. Abt. - Dir. Erdmann Sommer Performed in 1930г. Music: N. Ivanov Lyrics: Sergey Aleksandrovich Podelkov 1941. "Well be together forever, GDR and Soviet Union"
Can be translated as "United front"
Music: Eysler Lyrics: Brekht 1934.